And that’s pretty much how it happened. Except I didn’t have a gunner to make a funny quip to when it did. The gap in the swim formed early. I got mixed up with some other swimmers, but nothing out of the ordinary. The group split into left/right packs that then pretty quickly merged back together. I was on the left hand side of the right hand pack, and then it seemed like the pack was one, and I was off the back of it. I actually felt like I was swimming well. And until I came out of the water and saw 00:59:XY on the clock, I thought I might have been having a good swim, stuck between the first and second packs. A bad swim would have meant that the pro women would have caught me, right? But it was a slow day on the way back in with a strong current; the sort of day that hurts less powerful swimmers. Like pro women. And like me. I really missed the mass pro start today. It would have been really nice to have some of those red caps to chase. But it wasn’t to be. And it’s for the best for the women. And there really shouldn’t have been any reason I didn’t make that second pack. This was the first time I’ve had a poor swim in a race where I haven’t been swimming poorly in training. But, I think in retrospect I might have been swimming poorly if I looked at what ultimately mattered in this race – front end speed. I thought my speed was good, but it was more my 400+ speed that was solid, not the 200 and shorter speed. I did not expect to get dropped so early, and I actually had focused on making sure I had the deep fitness to bridge gaps when the bunch typically splits after making the second turn to come back into shore. I definitely didn’t assume that I was going to be okay. I don’t think I could have swam any harder in that first 200-300m, though of course the little man on my shoulder insists I probably could have. Even here I think I’m probably stretching the powers of my recollective ability. Out of the water in 59+, I knew it was going to be a tough day. My plan in case this happened was to ride pretty much as steady as possible – I wasn’t going to close a big gap like that; maybe push a bit extra overall power throughout the bike, especially in the latter part of the ride; and then roll the dice a bit on the run. And that’s pretty much what I did. After a bad swim, I was able to execute what I think was probably the best plan to put me back into the race. But riding solo is tough. Especially when it’s off the back. There’s no passing and being passed, which offers a bit of a draft. And there’s no media attention. None of these things should matter in a solo effort, but this is not a solo effort, it’s a race. And I don’t propose that we give up media coverage or expand to an absurdly long draft zone that discourages passing just because there are a couple guys like me that sometimes swim extra crappy. But some of the post race power files – which show I put out more watts, more w/kg, and still went slower than guys up front – just prove that the swim is a key part of the race. Given that the swim is so short, perhaps the benefit to being up front is justified, as it magnifies the importance of the swim, giving it a bit more gravitas than it would otherwise have. Regardless, I know the way this all works, and I’m not complaining. I should just swim better. That’s the solution, not wishing for different rules and realities. Coming off the bike, I figured I’d need a sub-2:50 run to get me into the top-10. I actually think a 2:45 was doable, but not on this day (it was a slow day, looking at the relative run performances of others), and not by me on this day (fourth 8+ hr race and third Ironman). I ran really well – on target – until 30km, which is pretty much when the hammer is going to fall if it is gonna fall. And that’s where I think the evidence of a long season not focused around Kona really showed up, as I knew it might. Ultimately, I made my way into 10th, though it was more like 11th in some ways since Marino dropping out with a huge lead was quite unexpected; he could have sat at an aid station and iced down for 15min and still probably finished in the top-5. And maybe I could have made it one more spot. But just getting to 10th – and then trying to snap the elastic to Dirk – was just too much. I pushed the envelope on caffeine (I needed the boost) and in hot conditions with a lot of fluid intake running at the red line, a pit stop (or two) was likely inevitable. The first one was in/out and back on the run feeling good. The second – at about 23mi – was a sign that I’d just gone too deep into the well. I was dizzy when I started to run again, and I actually wondered if I’d make it. That ~10min/mile stretch (including stoppage time) of 2.5ish miles was a rough go. I knew I’d finish – even if I had to walk – but I thought walking was a real possibility. I did what I needed to do to get myself into 10th, but ultimately the cost was just too high. I raced basically 8:41 of my 8:42 finish solo. By the time someone ended up in my sights, it was because they were going backwards, not because they were someone to share any part of the burden – even just the struggle of being alone – with. The conditions were hard, but nothing worse – and actually a bit easier I think – than I expected. This is a tough course because of the competition. In New York, which was certainly worse conditions on the run, I had a 10min lead at mile 16. Here? I had 10 guys still ahead of me. That is what makes it hard to race in Kona. Trying to eke out an extra 1% from yourself is a whole lot harder than knowing you can give up 1% and still win the race. 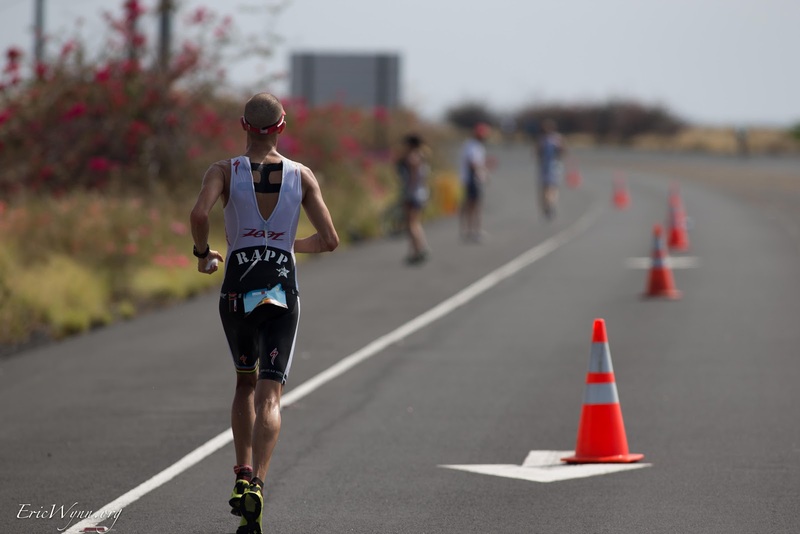 Kona is a challenging course, certainly, but it’s the competition that makes it tough. I felt entirely prepared and comfortable with the conditions. I race well in hot and humid and windy conditions, and I think that showed. What I do not do well with is really fast and challenging swims. And, knowing that, this race is going to require that I adapt as an athlete if I want to do well. But I already knew that. More than the fatigue hammer dropping on me at 30km into the run, the real price I paid for a long season with a bunch of long races was the lack of emphasis I was able to put into the swim. I had nine weeks in between NYC and Kona. Add in Leadman, and that meant I was never really able to say, “okay, I’m ready for the bike; I’m ready for the run; now let’s make sure I’m firing 100% on the swim.” I think I was swim-fit, just not swim-fast. For me, swim-fast requires a lot more work. But again, that’s not a surprise. That’s why I held off going to Kona in the first place (though I would have had the advantage of having women to swim with if I’d gone a year earlier), and it was my plan looking ahead to next year even before yesterday’s race unfolded. With a more Kona-focused season, I think I can come top-10 even with a subpar swim, as I think I would have been able to keep the wheels rolling in that last 7mi/12km. But I think a top-5 finish is doable (I’m not yet at the point where I can win this race without some really good luck for me and some really bad luck for a few others), but to do that, I need to swim reliably well, meaning giving up not more than 2:30 in the water. And certainly if I ever want to win this race, it’s a must-do change. I know I can swim that well, and I think I can even swim well enough to eventually be in contention for the win. But what I have yet to do is swim that well while also biking and running well enough to capitalize on it. So that’s the plan for 2013 (and beyond). A plan that, after a little bit of r&r, I’ll get to work on. Solid perspective after a tough day out there, bro. Hopefully you've got a bit of time left to relax and enjoy Hawai'i with Jill & Q before you head back to the mainland to start laying down the early work for next season. Good job on a really tough day. The competition there, across the board, is amazing. And humbling. Thankfully I have no aspirations to Kona. Well, until I saw the floating espresso bar. Just might be worth it for that. Good job, Jordan! Among the most thoughtful, introspective, and intellectually honest race reports I have ever read. Thank you! Jordan – very very much appreciated. And again some great perspective on how to approach and deal with a race. Would love to hear about your nutrition when your ready.